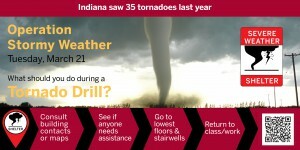 Know where to go during Tuesday’s tornado drills? On Tuesday, students and staff at Indiana University will have the opportunity to try out what they would do if in the path of a tornado. As our peers at IU Kokomo know, the threat is real — a tornado caused considerable damange near the Kokomo campus last summer. While Indiana averages 20 tornadoes annually, it saw 35 last year. 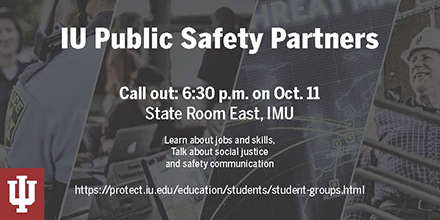 IU’s Operation Stormy Weather is held in conjunction with drills conducted by schools, municipalities and emergency management agencies statewide. New this year — IU is automating its IU-Notify emergency alerts so that tornado warnings can be issued several minutes quicker. Not only can it cause a complete loss of access to files on your local machine, but also to any shared networked drive(s). This means your misstep can not only lead to the loss of your baby pictures, but may also cause others to lose access to their files which may include dissertations, budgets, music, accounts receivable files, etc. Sara Chambers, IU’s Chief Privacy Officer, and Tim Goth, incident response manager for the University Information Policy Office, share insights and tips for keeping your digital data and that of others safe. Two cybersecurity articles caught my eye today. 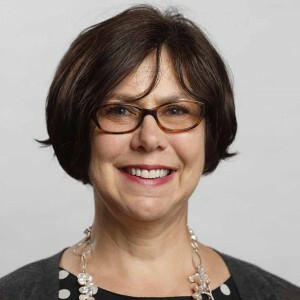 One discusses ransomware attacks on universities and quotes my colleague Kim Milford, executive director of REN-ISAC, Research and Education Networking Information Sharing and Analysis Center, which is based at IU. The other article discusses research from the Pew Research Center that shows Americans surveyed are generally loose with their password security while also doubting government agencies can protect their data. In Inside Higher Ed’s article Your Data or Your Money: Hackers are locking colleges’ data away and demanding payment to return it. But paying the ransom raises new issues, experts say, experts say paying the ransom when a ransomware attack locks you out of your data and threatens to make it unusable doesn’t always solve the problem. 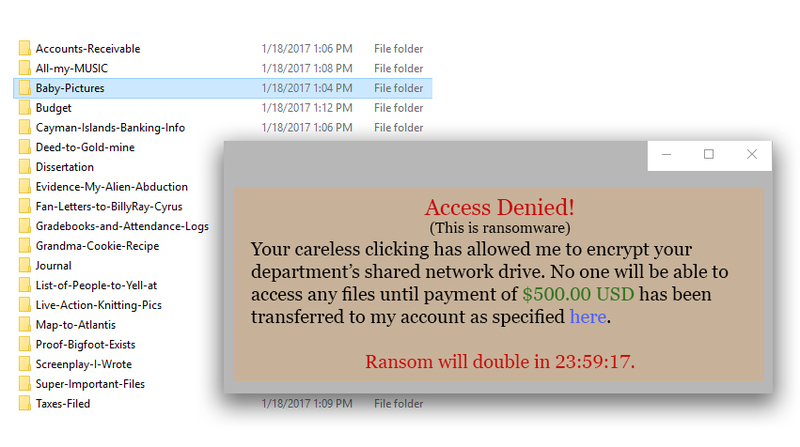 Ransomware has been around since the 80s, according to the article, but has become a more common threat in recent years. Sometimes data is not restored even after the ransom is paid. For managing plan access, the use of the Gatekeeper role has been discontinued — the user type “plan manager” will be used for managing plan content and access. Two other roles are available – “plan editors” can update individual plan content and “plan viewers” have view only access. Lt. Steve Miller’s Food with 5-0 program offers cooking classes to students living in IU Southeast lodges. Students not only learn tips on how to keep themselves from setting off fire alarms, but also how to prepare deliciously easy dishes that won’t break the bank. Miller is a 15-year veteran who enjoys sharing his culinary talents with those he protects and serves on an everyday basis. 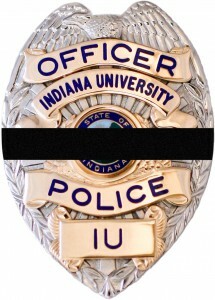 As captain of operations for IU Police Department Bloomington, Capt. Andy Stephenson is responsible for the patrol, investigations, training, and special events and programs divisions, as well as part-time officers and cadets, and auxiliary and security officers. As such, Stephenson supervises most of the individuals who have direct contact with members of the IU community, and he often can be found out and about on campus. These are Stephenson’s sentiments, but they match those of public safety leadership and university administration. With classes well underway and a flurry of events and activity occurring on the Bloomington campus, I want to take a moment to address concerns regarding police abuse of power and use of force, and the impact on our campus, that some of you have shared with me. We have all witnessed controversial and, in some cases, unlawful police conduct in media reports. Likewise, some of you have, undoubtedly, had a personal experience that may have contributed to the forming of a negative viewpoint of not only a particular police officer but of all police officers. 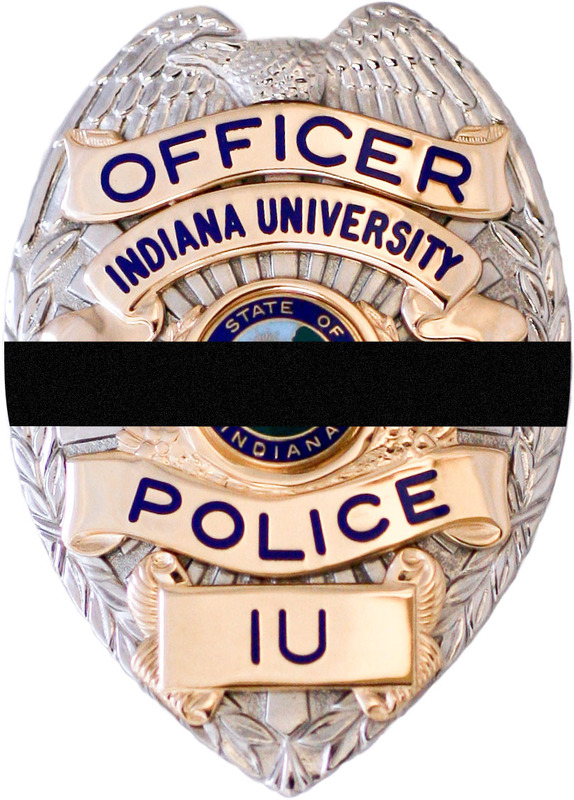 The men and women of the Indiana University Police Department share your concern. We acknowledge and recognize your fear. The IUPD has transitioned to a policing philosophy oriented toward customer service and positive interaction between police and citizens. We are updating our procedures on all campuses to reflect this and to align with best practices in the field. We are providing our officers with contemporary training on topics such as unbiased policing, de-escalation techniques, community relations, diversity, etc. The IU Police Academy entrusts us with a unique and very important responsibility and enables us to make an even greater contribution to the future of policing in the United States. Our police academy graduates are IU students and future alumni who will work as police officers throughout the country. Our goal is to produce highly trained and educated, customer-service oriented officers who have been exposed to many different races and cultures and who can truly have a positive impact on the policing profession. No matter your race, ethnicity, gender identity, sexual orientation, religion, national origin, disability or socioeconomic status, the IUPD serves every member of our community fairly, equally and without bias. Nothing less will be tolerated. Bias-based incidents should be reported to the IUPD and/or the Office of the Dean of Students. Indiana University should be a safe haven where cultures from all over the world converge to live, share ideas and grow together. We must all come together to ensure that the rights of every member of our community are respected. We must work together to maintain an environment in which all students, faculty and staff can thrive in their pursuit of excellence. We must communicate with one another to solve problems so that we can prevent safety and crime issues from having a negative impact on our quality of life and the academic success of students. We want to get to know you, and we invite you to get to know us. A vast majority of IUPD employees are IU alum who have a deep commitment to ensuring that those who call IU home have a world-class experience during their years on campus. We are a transparent organization. All are welcome to stop by the police department and take a tour, to schedule a ride-along with an officer, to explore our websites, to join us on Facebook or to simply take advantage of an opportunity to approach an officer and have a conversation. 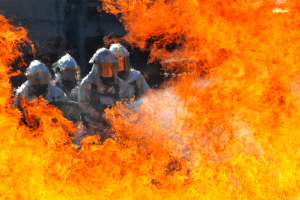 We offer seminars and presentations on a variety of topics, including active shooter response, self-defense for women, alcohol and drug abuse awareness, and many others. In addition, our police instructors can create a presentation to meet your needs for any safety-related subject. 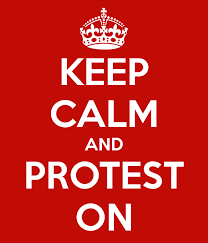 College campuses and demonstrations go together like peanut butter and jelly. 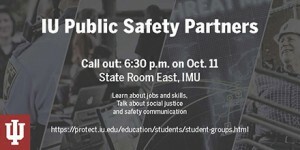 The goal of the Indiana University Police Department is to keep demonstrators and counter-demonstrators safe and to keep disruptions to university business (classes, for example) to a minimum. Significantly disrupting university operations. Protesters may enter university buildings but not private offices, labs, studios or other areas not open to the general public — unless invited by someone who manages the space. When inside university buildings, protesters should not linger and must leave if asked by someone who manages the building. They should keep the noise down and avoid blocking normal pedestrian traffic. When you’re crossing streets and driving through campus, it’s not the time to zone out on devices or to music. 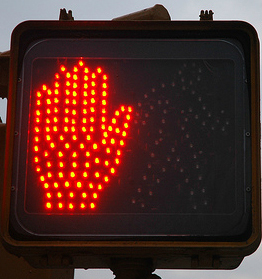 Pedestrians should follow all crossing signs. IU Police Department urges both pedestrians and drivers to pay attention and be patient when traveling throughout Indiana University’s campuses. Special pedestrian crossing lights have been installed on New York Street at IUPUI and will be installed at three locations on Michigan Street. At IU Bloomington in recent years, crossings have been made more visible and islands have been installed to slow traffic. Police say it’s important for pedestrians to follow the directions on pedestrian crossing signs – when the hand is flashing red and when the number countdown is red, pedestrians should not begin crossing a street. Citations are rarely issued, but failing to cross at crosswalks or crossing against the traffic lights could result in a $150 citation.